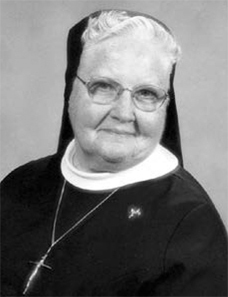 Sister Maria Angelica, I.H.M., formerly Mary Catherine McGovern, died Jan. 19 in Camilla Hall, Immaculata, in the 68th year of her religious life. She was 86 years old. Born in Philadelphia, Sister Maria Angelica entered the Congregation of the Sisters, Servants of the Immaculate Heart of Mary in 1944 from Nativity B.V. M. Parish in Philadelphia, and professed her first vows in 1947. She received a Bachelor of Arts degree from Immaculata University and a Master of Arts from Villanova University. Sister Maria Angelica taught in the elementary schools of the Archdiocese of Philadelphia and the Dioceses of Harrisburg and Arlington. She also served as director of religious education in the Diocese of Arlington for nine years. In 2007 Sister Maria Angelica was assigned to Camilla Hall. Her ministry there was the apostolate of prayer. The funeral Mass was celebrated Jan. 22 at Camilla Hall. Father William Dean was the celebrant and homilist. Msgr. Richard T. Bolger was a concelebrant. Interment followed in the Immaculata Cemetery. In addition to the members of her religious community, Sister Maria Angelica is survived by her sister, Sister Miriam James McGovern, S.S.J. ; a sister-in-law, Camille McGovern; nieces, nephews, grandnieces and grandnephews. She was predeceased by her parents, James and Marie Lyons McGovern, a brother, Thomas McGovern, and a sister, Norae Rieth.